Grand Theft Auto V, the game that has received mostly love, but also (unsurprisingly) some hate. Violence, crime and three playable anti-heroes are only words to describe the surface of the game (it also involved Yoga). 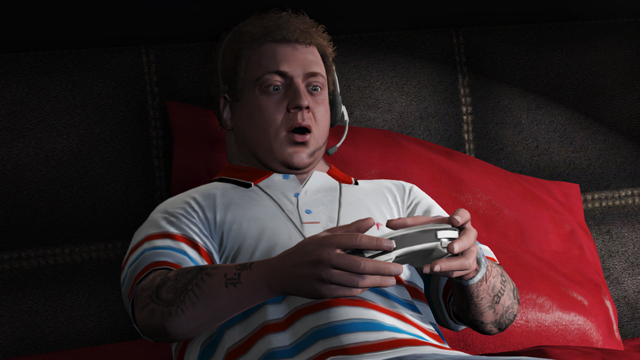 The crusade against violent video games has often had GTA as their main target for critique, and with GTA V becoming the fastest-selling entertainment product in history, the fifth installment to the series has faced a flood of articles in the media condemning the violence and criminal activities a player will go through. Most recently, the game was taken off shelves in Australia because of its content, and many found this a triumphant win. I disagree. As a gamer myself I am obviously biased in this matter. Not only do I feel the debate on violent video games and their relation to real-life violence is an outdated one, especially with the wave of research done that has proven there isn't a link, but putting GTA V at the front of these games as the worst one is like saying The Walking Dead is just about killing zombies - it's obviously also about stuff, things and walking around in pairs talking about "the group". On the surface, it might seem like GTA V glamourizes violence and crime, but if you look closely, you'll realize that the game is nothing more than a satire of real-life America and all of it's issues, wrapped up and played out with Los Angeles (Los Santos) as its backdrop. Ask yourself if what you see in the game is not something you might come across whenever you open a newspap..erm, go to a news website. People killing each other is not a new phenomenon. Issues of gun control, crime, violence against women and driving insanely fast is not something we haven't seen before, not only in the media, but on the big screen. In a way, GTA is really nothing more than a gamer playing through a news broadcast rather than just watching it. That fact doesn't mean they will go out and do it however, just like someone who plays Mario Kart won't find a go-kart and go crazy on the road. A certain scene in GTA V where one of your characters, Trevor, tortures a man is a scene many have referred to as sick, twisted and not suitable in a game. And it is a scene in which most GTA V-gamers do find troubling to play through, and that's exactly what the game wants you to feel. For didn't we most recently hear of the C.I.A's history of torture? Does this not already exist? People say we are desensitized by games - I say we're desensitized by the media. We read about the brutality of modern day America, both from the government and the citizens, yet we don't feel it. Playing that scene in GTA V is not pleasant, which is why the news of the C.I.A has on a personal note stuck with me longer than other news. In the game, it is not the character of Trevor who initiates it, but the F.I.B (GTA's F.B.I) agent that demands it. Your character frees the man on a later note, but I assume critics of the scene don't get to that part. "The media and the government would have us believe that torture is some necessary thing. We need it to get information, to assert ourselves. Did we get any information out of you? “I would have told you everything!” the man replies. "Exactly. Torture's for the torturer...or for the guy giving orders to the torturer. You torture for the good times - we should all admit that. It's useless as a means of getting information," Trevor says. Trevor (left) watching as the F.I.B agent talks to the victim. The government in GTA V is corrupt, it's politicians moreso. You see it in the consequences of your actions in the game; bump into someone accidentally, and police might come searching half a second later. Shoot someone on the wrong part of the town and they might not. And no matter what you do, it's "shoot first, talk later" that applies to them, which is something America has depressingly enough see too much of these past weeks. Every GTA-game have had their themes and locations, every one putting a satirical spotlight on the real issues in modern day America; Vice City was a critique of 80s politics and San Andreas was a look into the revocation of the right of suffrage among young African-Americans. And while GTA IV looked at issues around immigration, consumerism and technological progress, GTA V has expanded it's portrayal of society from certain themes to the full picture of some of the issues America faces, with Los Angeles as the perfect backdrop. GTA V might be scary and outrageous to some, but the actions the player go through as their characters aren't actions that haven't happened before. They are mirror images, though slightly saturated, of reality, of horrific events that take place on a daily basis, whether or not we choose to acknowledged these or sweep them under the rug. Open your eyes, crusaders. GTA V is showing us everything that's wrong with society, and making them more obvious to us than a news broadcast might. All pictures courtesy of Rockstar Games.